Seventy-two year old Yiannakis Fiouris vividly remembers the time before his home had running water and his family, like everyone else's, had to collect their water daily from public taps and fountains. He recalls the long queues that would form every morning in each neighbourhood in Nicosia outside the concrete block encased taps installed by the British. "It was a nightmare, every morning 20 to 30 people would all be queued up outside these taps trying to fill up their buckets," he said. Sometimes scuffles would break out as people tried to cut in line. "Back then people were illiterate and so cutting in would happen on a regular basis, but that didn't mean others didn't object and you would often see people shoving and pushing." he added. 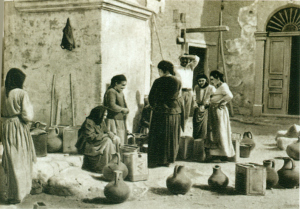 Fiouris said that every neighbourhood either had a large concrete tap, a well with a bucket or a well with a donkey which was attached to a system that would lift the bucket from the well. "It was mainly the housewives who would struggle with the water as they would have to wake up from the crack of dawn to go get water to make sure there was plenty in the house. That isn't to say they didn't enjoy themselves, with the taps being a meeting point where they would gossip and talk about what was going on," he added. Needless to say every drop counted. Back then, the now ubiquitious sight of an elderly lady hosing down a drive way would not only have been shameful; it would have been downright impossible. Read the rest of this story . . . .